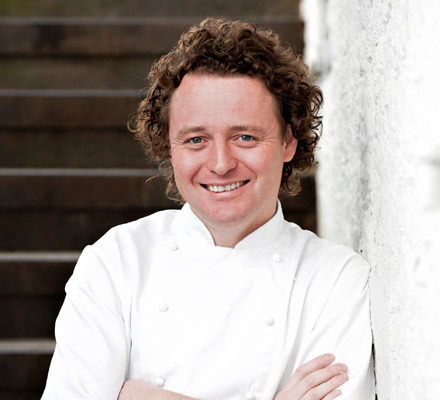 Tom Kitchin talks about his hard-working life at Michelin-starred restaurant kitchens. Most chefs consider their restaurant kitchens their home, and Tom Kitchin is no different. On a recent trip, the Michelin-star chef flew in to Dubai on a Saturday – as his restaurant in Edinburgh, The Kitchin, is closed on Sunday and Monday – and was so keen on getting back into his kitchen the minute it opened for service, that he made sure he flew back on Monday evening. Now, that’s dedication! The curly haired Scottish chef was born in Edinburgh, but grew up in Perthshire, Scotland, and is one of those people whose childhood passions of being a chef didn’t only survive, but thrived. He loved the kitchen and its bustling atmosphere ever since he first stepped into one. “I began by washing pots and pans at 15, and then moved on to helping with starters and cooking at a local pub for pocket money over the weekends,” he says. Tom’s enthusiasm for the kitchen life saw him dropping out of school at the age of 16 to follow his dream. With no qualifications in hand, and just a year of basic cookery training from Perth College UHI in Scotland, he jumped into his first full-time apprenticeship at The Gleaneagles Hotel in Perthshire, and later moved to London to work with three-Michelin starred chef Pierre Koffmann, who is now his mentor. “I worked with Pierre at his three-star Michelin restaurant, La Tante Claire, at the age of 18. London is so big, and when I worked there I was under a lot of pressure as I wanted to gain his trust. I was learning from a master,” he says. Tom describes his experience in London as a battle, but one which made him stronger. After gaining five years of hands-on experience in London, Pierre sent Tom to Paris to work with another three-Michelin starred chef, Guy Savoy. Tom was a young Scotsman with no French linguistic skills at that point, but all he knew was he had to prove himself. “I had learnt dedication from Koffmann, and it was vital for me to gain respect from a chef like Guy Savoy as well,” he says. A true example of how hard work can pay off, Tom was always the first to get into the kitchen, and the last to go out, and his experience with Guy Savoy saw him picking up French cooking techniques that he uses till today, at his restaurant. After two years, at the age of 25, Tom joined world renowned masterchef Alain Ducasse at three Michelin-star restaurant, Le Louis XV in Monte Carlo. It was here that Tom went back to basics and experienced cooking like never before. “Sometimes you have to go one step backwards to go two steps forward. When working with Ducasse, I had to learn cooking all over again. I picked up new techniques and it was a completely different environment from anywhere else I worked before,” he says. Tom credits the foundation of his cooking skills to his mentors, but also feels that they helped him define his own cooking style as well. He gave up the kitchen life to work as a chef on a private yacht, owned by British business magnates, the Bamfords, in 2004, and this is where he was brought back to the simplicity of cooking good food with what was available to him. “We sailed from the South of France to Italy, and I would stop by the markets to pick up fresh produce. It was a life-changing experience for me as I was away from the fine-dining kitchens and working for a family of real foodies,” he says. His newfound love for local produce influenced him and his Swedish wife Michaela, whom he met while working in London – who has a degree in Hotel Management and has worked at Savoy London, as well as Burj Al Arab – to finally combine their skills, and return to Edinburgh to open The Kitchin together in 2006. Opening the restaurant wasn’t easy though, and Tom and his wife went through several hardships initially. “We had to take a loan from the bank, borrow from family members and scrape to make ends meet,” he says. When asked about putting his family name on the door, Tom tells me, with a name like his, it was only natural to do so. The Kitchin is based in an old port area (Leith) which used to be dodgy, but is now very hip. “At first, the only people who visited the restaurant were my friends and family, but within six months it became crazy busy and we weren’t expecting it. We started with only 30 bottles of wine and now offer 300!” he says. A real family venture, the restaurant also has Tom’s father managing the business aspect. Scottish dishes with a French flair can be found on the menu, and it’s all made from local, seasonal produce. “It’s important to work with the seasons, and eat root vegetables and game in winter, or red fruits in summer. I always like to buy the best available and want to know who sells it,” he says. The Kitchin was awarded a Michelin star in 2007, just one year after it opened, making Tom the youngest Scottish chef to receive the star – he was 29. Over the last few years, Tom has helped revolutionise Edinburgh’s gastronomic scene, to the extent where he received an Honorary doctorate of Arts degree from Edinburgh Napier University for his contribution to Scottish Food Culture. “I was extremely honoured when I received the award, because I was just doing what I love. Scottish produce is phenomenal, thanks to the mountains and the sea. For example, the big tides allow scallops to be sold in abundance, and we get great lobster and langoustine fresh of the boat as well,” he says. A champion of Scottish produce, Tom loves stirring up a conversation about locally sourced produce with diners, and makes sure they are all handed a map of Scotland, where the ingredients used in dishes are marked according to where they are sourced from. Tom’s love for seasonal cooking is so profound that he released a cookbook, From Nature to Plate: Seasonal Recipes (Phoenix) which includes a selection of restaurant-style, easy-to-cook recipes for every season. “In Scotland, like most countries, you see children having fried food or fizzy drinks and it’s horrible,” he says. Tom is the father of four boys, all under the age of seven, and he makes sure they eat healthy, balanced meals. Something of a Jamie Oliver for Scotland, he also visits schools occasionally to educate children on the importance of eating healthy. Kitchin suppers (Quadrille Publishing Ltd), Tom’s second book, features a range of recipes perfect for home cooks who want to make a nice meal for the family. “The book has recipes my mom used to make, like chicken and broccoli bake, and other easy dishes with a Swedish touch courtesy of my wife, like smoked salmon lasagne,” he says. When Tom does manage to get out the kitchen, it’s mostly to appear on television for MasterChef UK and BBC’s Saturday Kitchen. “I love working on television, because these shows are not scripted and I get to be a bit cheeky,” he says. Tom has also worked onscreen with celebrity chefs Theo Randall and Michel Roux Jr. The TV show, The Chef Protégé, saw Tom going back to his alumnus Perth College to train and mentor seven protégés, who then competed against the other chefs’ protégés, to cook for the chefs’ mentors in the finale; Tom’s mentor was Pierre Koffmann. “My protégé won the competition and made me very proud,” says Tom. he loves nothing more than spending quality time with his wife and children over a Sunday roast! Previous Post&LeftArrow; Previous Authenticity kills creativity!